J.D. Power today released their 2018 North America Airline Satisfaction Study for the 14th year. The study is based on responses from more than 11,000 passengers who flew on these airlines between March 2017 and 2018. The survey results shouldn’t come as a surprise to anyone. Alaska Airlines and Delta are leading the full service segment and Southwest Airlines and JetBlue the low coast one. You can access J.D. Power’s website for the study here. COSTA MESA, Calif.: 30 May 2018 — Airline investments in newer planes, improved customer satisfaction with overhead storage compartments and cheaper fares have driven a seventh straight year of improved customer satisfaction, according to the J.D. Power 2018 North America Airline Satisfaction Study.SM. Overall passenger satisfaction with airlines improves to 762 (on a 1,000-point scale) in 2018, a record high. “With a single exception, airlines in North America show consistent improvements across all the factors, from booking a ticket to handling luggage,” said Michael Taylor, Travel Practice Lead at J.D. Power. “Operationally, it’s never been a better time to fly. Passengers perceive greater value in ticket prices, checking in has never been easier, passengers are more satisfied with the actual aircraft and airlines have improved their baggage-handling performance. Record-high customer satisfaction: Overall satisfaction with airlines in 2018 increases by 6 points to 762, continuing a seven-year trend of steady performance increases. Both traditional and low-cost carriers have improved. Newer, bigger, better: Annual improvement in overall customer satisfaction is driven by increased satisfaction with the aircraft (+15 points); a better experience with boarding/deplaning/baggage (+10) and reservation (+11); and satisfaction with costs & fees (+8). The attribute contributing to improved customer perceptions of the aircraft is availability of overhead storage, an area in which the study’s top-ranked airlines have recently invested significantly. “Please discontinue the use of electronic devices”: Airlines continue to struggle to meet customer expectations for device connectivity, with in-flight services scoring lower than any other factor in the study. Compared with aircraft offering seatback screens, passengers using their own mobile devices to access in-flight services are less satisfied with the variety of in-flight entertainment available and availability of in-flight services. Keeping pace with improvements in Wi-Fi technology is a difficult and expensive proposition for the airlines. 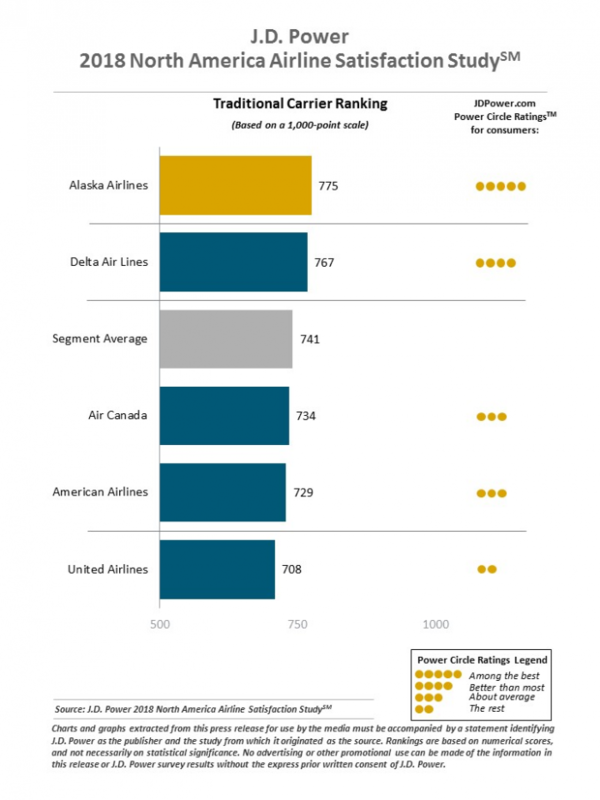 Among traditional carriers, Alaska Airlines ranks highest for the 11th consecutive year, with a score of 775. Alaska Airlines performs particularly well in all seven factors of the study, with a great deal of improvement coming from investments in new overhead bins that fit roll-aboard bags better than traditional bins. Delta Air Lines (767) ranks second. Among low-cost carriers, Southwest Airlines ranks highest for the second consecutive year, with a score of 818. Southwest Airlines performs particularly well in all seven factors, driven in large part by investments made in fleet improvements. JetBlue Airways (812) ranks second. The carriers showing the most improvement in overall customer satisfaction from last year are Allegiant, which increases 58 points to 725, and Air Canada, which increases 25 points to 734. The North America Airline Satisfaction Study, now in its 14th year, measures passenger satisfaction with airline carriers in North America based on performance in seven factors (in order of importance): cost & fees; in-flight services; aircraft; boarding/deplaning/baggage; flight crew; check-in; and reservation. The study measures passenger satisfaction among both business and leisure travelers, and is based on responses from 11,508 passengers who flew on a major North American airline between March 2017 and March 2018. The study was fielded between April 2017 and March 2018. United is still dead last on the full service segment at the same numerical level with Frontier and Allegiant. You have to keep in mind that this survey was done within the general population of which many must not hold any status. I would say, however, that the results are indicative of the level of customer service you can expect to receive from these airlines.